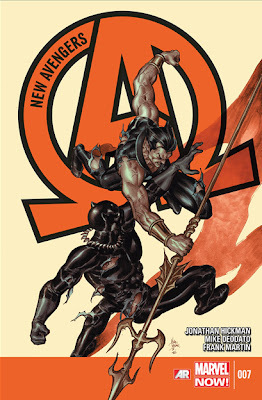 The third volume of New Avengers has consistently been my favorite of mine since its initial release. Aside from the rich writing and beautiful artwork, New Avengers offers readers a look into the "darker" side of superhero-ing with characters that have classically been strictly "good." In the first six issues of the series, we see the Illuminati dealing with a world-crisis situation, throwing pieces of their morality to the wind in the process. Now, with New Avengers #7, Hickman begins painting a picture of the personal tolls that such actions have taken. New Avengers #7 takes place one month after the world-colliding event in Latveria. In the aftermath, we see that each member of the Illuminati has more or less returned to their normal lives. That being said, the tension in the writing is very real and shows that the incursions are still very much on the minds of everyone involved. While the aspects of several other of the members are mentioned, this issue's main focus was on Namor and the Black Panther. After the AvX fallout, the two have been on understandably rocky terms. Hickman takes this opportunity to show that New Avengers is about more than just the incursions and the end of the world; he shows that life must go on, especially the parts of life that involve getting revenge for the slaughter of thousands of people. Overall, the story-telling in this book was a little choppy, but it's tough to cover so many characters within twenty-some pages. Hickman managed to pull it off without too much going wrong. The art is, as usual, perfect, although I did have one small gripe. On the panels with Dr. 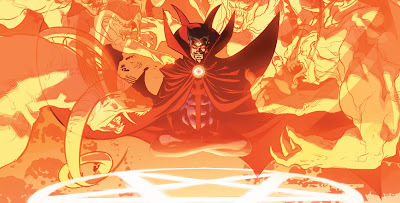 Strange, it shows his Eye of Agamotto amulet in the open position. When not in use, the amulet is usually closed, which begs the question: Is this just an oversight? or is Doctor Strange actually using the amulet while having dinner with Doctor Doom? Either way, kudos to Deodato for a great job! I'm glad Deodato's style isn't a huge departure from the previous pencilings by Epting. Looking forward, we see that the next cover features Blackbolt and the Inhumans, which leads me to believe that Hickman is going to take a slight detour to flesh out each one of the characters we saw in this issue one by one. With that being said, I sincerely hope that Hickman is able to bring in some further characterization for the heroes that have, as of recently, only been relegated to the background (namely Doctor Strange, Blackbolt, and Beast). Doctor Strange in particular has an incredibly unique skill set that I think would be a great asset both to saving the world and saving his character from the D-tier heroes list.